Hello pretty yellow and bright sun! 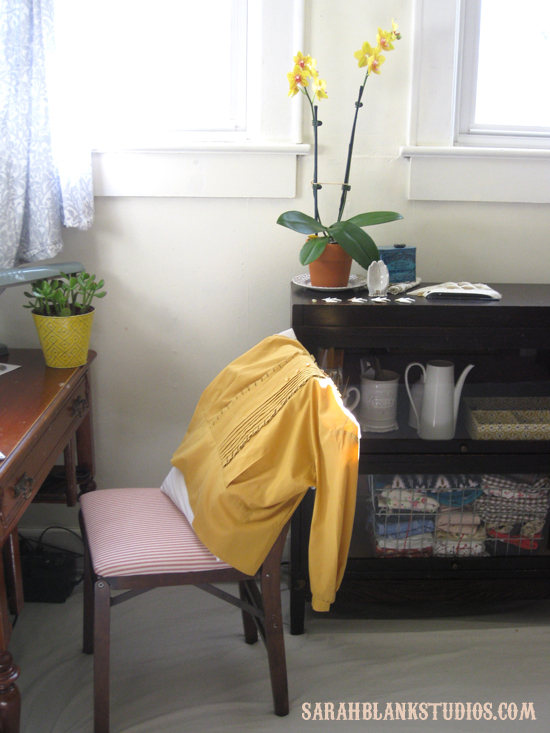 Totally unintentional, a corner of my studio room collecting yellowish things. Yellow is so terrific! A new orchid from my husband as a gift for our anniversary, sweet ruffled 50’s blouse to be mended, yellow flower pot with a Jade plant growing within from Trader Joes (I like Jade so much!). My studio has been rearranged and reorganized, hooray! Today we went to the pumpkin patch and took silly photos. And I am stating to be able to steal away little tidbits of time to do things. Very nice indeed!